Published by Cyril Huze April 15th, 2016	in Builders, Editorial and Videos. 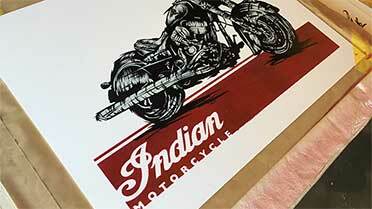 On Saturday April 16, customers who test drive an Indian motorcycle at their local dealership can leave with a handcrafted piece of Indian Motorcycle art, a limited edition Chief Dark Horse poster created by LA artist Mathew Curran (while supplies last). Indian and agency Saatchi & Saatchi agency Team One asked stencil artist Matthew Curran to create the pieces, which are made with the signature Indian Red paint and feature Indian’s Chief Dark Horse motorcycle. See in the video below Curran at work stenciling and painting the prints. The video was posted on Indian’s social channels and emailed to its mailing lists, and individual dealers were given assets to promote the effort on their social channels. I remembered this was going on at around 2:00pm this past Saturday. So, off the the local dealer I went. I took the test ride and the beautiful free poster is in hand. I thought I would get it framed at a local framing shop up the road a piece. $200 bucks later, I am going to have the nicest framed poster around. I had no idea framing could cost so much. Granted, it is the deluxe frame package, but whew!